Walt Disney was born on December 5, 1901, at 1249 Tripp Avenue, in Chicago's Hermosa neighborhood. [lower-alpha 1] He was the fourth son of Elias Disney‍—‌born in the Province of Canada, to Irish parents‍—‌and Flora (née Call), an American of German and English descent. [lower-alpha 2] Aside from Disney, Elias and Flora's sons were Herbert, Raymond and Roy; the couple had a fifth child, Ruth, in December 1903. In 1906, when Disney was four, the family moved to a farm in Marceline, Missouri, where his uncle Robert had just purchased land. In Marceline, Disney developed his interest in drawing when he was paid to draw the horse of a retired neighborhood doctor. Elias was a subscriber to the Appeal to Reason newspaper, and Disney practiced drawing by copying the front-page cartoons of Ryan Walker. Disney also began to develop an ability to work with watercolors and crayons. He lived near the Atchison, Topeka and Santa Fe Railway line and became enamored with trains. He and his younger sister Ruth started school at the same time at the Park School in Marceline in late 1909. In January 1920, as Pesmen-Rubin's revenue declined after Christmas, Disney and Iwerks were laid off. They started their own business, the short-lived Iwerks-Disney Commercial Artists. 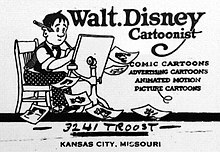 Failing to attract many customers, Disney and Iwerks agreed that Disney should leave temporarily to earn money at the Kansas City Film Ad Company, run by A. V. Cauger; the following month Iwerks, who was not able to run their business alone, also joined. The company produced commercials using the cutout animation technique. Disney became interested in animation, although he preferred drawn cartoons such as Mutt and Jeff and Koko the Clown. With the assistance of a borrowed book on animation and a camera, he began experimenting at home. [lower-alpha 3] He came to the conclusion that cel animation was more promising than the cutout method. [lower-alpha 4] Unable to persuade Cauger to try cel animation at the company, Disney opened a new business with a co-worker from the Film Ad Co, Fred Harman. 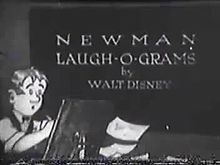 Their main client was the local Newman Theater, and the short cartoons they produced were sold as "Newman's Laugh-O-Grams". Disney studied Paul Terry's Aesop's Fables as a model, and the first six "Laugh-O-Grams" were modernized fairy tales. Early in 1925, Disney hired an ink artist, Lillian Bounds. They married in July of that year, at her brother's house in her hometown of Lewiston, Idaho. The marriage was generally happy, according to Lillian, although according to Disney's biographer Neal Gabler she did not "accept Walt's decisions meekly or his status unquestionably, and she admitted that he was always telling people 'how henpecked he is'. "[lower-alpha 5] Lillian had little interest in films or the Hollywood social scene and she was, in the words of the historian Steven Watts, "content with household management and providing support for her husband". Their marriage produced two daughters, Diane (born December 1933) and Sharon (adopted in December 1936, born six weeks previously). [lower-alpha 6] Within the family, neither Disney nor his wife hid the fact Sharon had been adopted, although they became annoyed if people outside the family raised the point. The Disneys were careful to keep their daughters out of the public eye as much as possible, particularly in the light of the Lindbergh kidnapping; Disney took steps to ensure his daughters were not photographed by the press. To replace Oswald, Disney and Iwerks developed Mickey Mouse, possibly inspired by a pet mouse that Disney had adopted while working in his Laugh-O-Gram studio, although the origins of the character are unclear. [lower-alpha 8] Disney's original choice of name was Mortimer Mouse, but Lillian thought it too pompous, and suggested Mickey instead. [lower-alpha 9] Iwerks revised Disney's provisional sketches to make the character easier to animate. Disney, who had begun to distance himself from the animation process, provided Mickey's voice until 1947. In the words of one Disney employee, "Ub designed Mickey's physical appearance, but Walt gave him his soul." To improve the quality of the music, Disney hired the professional composer and arranger Carl Stalling, on whose suggestion the Silly Symphony series was developed, providing stories through the use of music; the first in the series, The Skeleton Dance (1929), was drawn and animated entirely by Iwerks. Also hired at this time were several local artists, some of whom stayed with the company as core animators; the group later became known as the Nine Old Men. [lower-alpha 10] Both the Mickey Mouse and Silly Symphonies series were successful, but Disney and his brother felt they were not receiving their rightful share of profits from Powers. In 1930, Disney tried to trim costs from the process by urging Iwerks to abandon the practice of animating every separate cel in favor of the more efficient technique of drawing key poses and letting lower-paid assistants sketch the inbetween poses. Disney asked Powers for an increase in payments for the cartoons. Powers refused and signed Iwerks to work for him; Stalling resigned shortly afterwards, thinking that without Iwerks, the Disney Studio would close. Disney had a nervous breakdown in October 1931‍—‌which he blamed on the machinations of Powers and his own overwork‍—‌so he and Lillian took an extended holiday to Cuba and a cruise to Panama to recover. With the loss of Powers as distributor, Disney studios signed a contract with Columbia Pictures to distribute the Mickey Mouse cartoons, which became increasingly popular, including internationally. [lower-alpha 11] Disney, always keen to embrace new technology, filmed Flowers and Trees (1932) in full-color three-strip Technicolor; he was also able to negotiate a deal giving him the sole right to use the three-strip process until August 31, 1935. All subsequent Silly Symphony cartoons were in color. Flowers and Trees was popular with audiences and won the Academy Award for best Short Subject (Cartoon) at the 1932 ceremony. Disney had been nominated for another film in that category, Mickey's Orphans, and received an Honorary Award "for the creation of Mickey Mouse". Snow White premiered in December 1937 to high praise from critics and audiences. The film became the most successful motion picture of 1938 and by May 1939 its total gross of $6.5 million made it the most successful sound film made to that date. [lower-alpha 12] Disney won another Honorary Academy Award, which consisted of one full-sized and seven miniature Oscar statuettes. [lower-alpha 13] The success of Snow White heralded one of the most productive eras for the studio; the Walt Disney Family Museum calls the following years "the 'Golden Age of Animation' ". 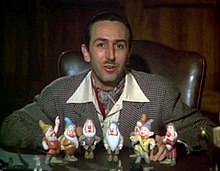 With work on Snow White finished, the studio began producing Pinocchio in early 1938 and Fantasia in November of the same year. Both films were released in 1940, and neither performed well at the box office‍—‌partly because revenues from Europe had dropped following the start of World War II in 1939. The studio made a loss on both pictures and was deeply in debt by the end of February 1941. In response to the financial crisis, Disney and his brother Roy started the company's first public stock offering in 1940, and implemented heavy salary cuts. The latter measure, and Disney's sometimes high-handed and insensitive manner of dealing with staff, led to a 1941 animators' strike which lasted five weeks. 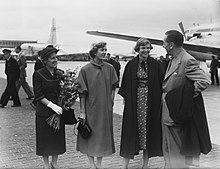 While a federal mediator from the National Labor Relations Board negotiated with the two sides, Disney accepted an offer from the Office of the Coordinator of Inter-American Affairs to make a goodwill trip to South America, ensuring he was absent during a resolution he knew would be unfavorable to the studio. [lower-alpha 14] As a result of the strike‍—‌and the financial state of the company‍—‌several animators left the studio, and Disney's relationship with other members of staff was permanently strained as a result. The strike temporarily interrupted the studio's next production, Dumbo (1941), which Disney produced in a simple and inexpensive manner; the film received a positive reaction from audiences and critics alike. The military films generated only enough revenue to cover costs, and the feature film Bambi‍—‌which had been in production since 1937‍—‌underperformed on its release in April 1942, and lost $200,000 at the box office. On top of the low earnings from Pinocchio and Fantasia, the company had debts of $4 million with the Bank of America in 1944. [lower-alpha 15] At a meeting with Bank of America executives to discuss the future of the company, the bank's chairman and founder, Amadeo Giannini, told his executives, "I've been watching the Disneys' pictures quite closely because I knew we were lending them money far above the financial risk. ... They're good this year, they're good next year, and they're good the year after. ... You have to relax and give them time to market their product." Disney's production of short films decreased in the late 1940s, coinciding with increasing competition in the animation market from Warner Bros. and Metro-Goldwyn-Mayer. Roy Disney, for financial reasons, suggested more combined animation and live-action productions. [lower-alpha 16] In 1948, Disney initiated a series of popular live-action nature films, titled True-Life Adventures, with Seal Island the first; the film won the Academy Award in the Best Short Subject (Two-Reel) category. In early 1950, Disney produced Cinderella, his studio's first animated feature in eight years. It was popular with critics and theater audiences. Costing $2.2 million to produce, it earned nearly $8 million in its first year. [lower-alpha 17] Disney was less involved than he had been with previous pictures because of his involvement in his first entirely live-action feature, Treasure Island (1950), which was shot in Britain, as was The Story of Robin Hood and His Merrie Men (1952). Other all-live-action features followed, many of which had patriotic themes. [lower-alpha 18] He continued to produce full-length animated features too, including Alice in Wonderland (1951) and Peter Pan (1953). 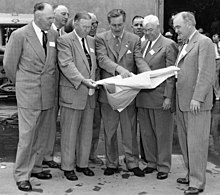 From the early to mid-1950s, Disney began to devote less attention to the animation department, entrusting most of its operations to his key animators, the Nine Old Men, although he was always present at story meetings. Instead, he started concentrating on other ventures. The money from ABC was contingent on Disney television programs. The studio had been involved in a successful television special on Christmas Day 1950 about the making of Alice in Wonderland. Roy believed the program added millions to the box office takings. In a March 1951 letter to shareholders, he wrote that "television can be a most powerful selling aid for us, as well as a source of revenue. It will probably be on this premise that we enter television when we do". In 1954, after the Disneyland funding had been agreed, ABC broadcast Walt Disney's Disneyland, an anthology consisting of animated cartoons, live-action features and other material from the studio's library. The show was successful in terms of ratings and profits, earning an audience share of over 50%. [lower-alpha 19] In April 1955, Newsweek called the series an "American institution". 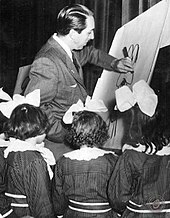 ABC was pleased with the ratings, leading to Disney's first daily television program, The Mickey Mouse Club, a variety show catering specifically to children. The program was accompanied by merchandising through various companies (Western Printing, for example, had been producing coloring books and comics for over 20 years, and produced several items connected to the show). One of the segments of Disneyland consisted of the five-part miniseries Davy Crockett which, according to Gabler, "became an overnight sensation". The show's theme song, "The Ballad of Davy Crockett", became internationally popular, and ten million records were sold. As a result, Disney formed his own record production and distribution entity, Disneyland Records. Despite the demands wrought by non-studio projects, Disney continued to work on film and television projects. In 1955, he was involved in "Man in Space", an episode of the Disneyland series, which was made in collaboration with NASA rocket designer Wernher von Braun. [lower-alpha 20] Disney also oversaw aspects of the full-length features Lady and the Tramp (the first animated film in CinemaScope) in 1955, Sleeping Beauty (the first animated film in Technirama 70 mm film) in 1959, One Hundred and One Dalmatians (the first animated feature film to use Xerox cels) in 1961, and The Sword in the Stone in 1963. His estate included a 14 percent holding in Walt Disney Productions worth $20 million. [lower-alpha 23][lower-alpha 24] He left 45 percent of his estate to his wife and children‍—‌much in a family trust‍—‌and 10 percent to his sister, nieces and nephews. The remaining 45 percent went into a charitable trust, 95 percent of which was designated for CalArts, to build a new campus (a figure of around $15 million); he also donated 38 acres (0.154 km2) of the Golden Oaks ranch in Valencia for construction of that school. The university moved there in November 1971. Disney's plans for the futuristic city of EPCOT did not come to fruition. After Disney's death, his brother Roy deferred his retirement to take full control of the Disney companies. He changed the focus of the project from a town to an attraction. At the inauguration in 1971, Roy dedicated Walt Disney World to his brother. [lower-alpha 25] Walt Disney World expanded with the opening of Epcot Center in 1982; Walt Disney's vision of a functional city was replaced by a park more akin to a permanent world's fair. In 2009, the Walt Disney Family Museum, designed by Disney's daughter Diane and her son Walter E. D. Miller, opened in the Presidio of San Francisco. Thousands of artifacts from Disney's life and career are on display, including numerous awards that he received. In 2014, the Disney theme parks around the world hosted approximately 134 million visitors. Disney has been accused of anti-Semitism,[lower-alpha 26] although none of his employees‍—‌including the animator Art Babbitt, who disliked Disney intensely‍—‌ever accused him of making anti-Semitic slurs or taunts. The Walt Disney Family Museum acknowledges that ethnic stereotypes common to films of the 1930s were included in some early cartoons. 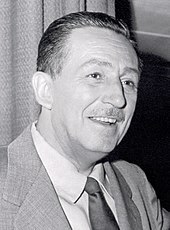 [lower-alpha 27] Disney donated regularly to Jewish charities, he was named "1955 Man of the Year" by the B'nai B'rith chapter in Beverly Hills, and his studio employed a number of Jews, some of whom were in influential positions. [lower-alpha 28] Gabler, the first writer to gain unrestricted access to the Disney archives, concludes that the available evidence does not support accusations of anti-Semitism and that Disney was "not [anti-Semitic] in the conventional sense that we think of someone as being an anti-Semite". Gabler concludes that "though Walt himself, in my estimation, was not anti-Semitic, nevertheless, he willingly allied himself with people who were anti-Semitic [meaning some members of the MPAPAI], and that reputation stuck. He was never really able to expunge it throughout his life". 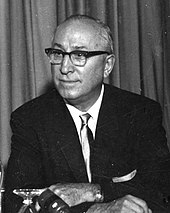 Disney distanced himself from the Motion Picture Alliance in the 1950s. Disney has also been accused of other forms of racism because some of his productions released between the 1930s and 1950s contain racially insensitive material. [lower-alpha 29] The feature film Song of the South was criticized by contemporary film critics, the National Association for the Advancement of Colored People, and others for its perpetuation of black stereotypes, but Disney later campaigned successfully for an Honorary Academy Award for its star, James Baskett, the first black actor so honored. [lower-alpha 30] Gabler argues that "Walt Disney was no racist. He never, either publicly or privately, made disparaging remarks about blacks or asserted white superiority. Like most white Americans of his generation, however, he was racially insensitive." Floyd Norman, the studio's first black animator who worked closely with Disney during the 1950s and 1960s, said, "Not once did I observe a hint of the racist behavior Walt Disney was often accused of after his death. His treatment of people‍—‌and by this I mean all people‍—‌can only be called exemplary." ↑ $1.5 million in 1937 equates to $26,142,361 in 2019; $6.5 million in 1939 equates to $117,358,513 in 2019, according to calculations based on the Consumer Price Index measure of inflation. ↑ $4 million in 1944 equates to $56,930,057 in 2019, according to calculations based on the Consumer Price Index measure of inflation. ↑ $2.2 million in 1950 equates to $22,909,820 in 2019; $8 million in 1950 equates to $83,308,437 in 2019, according to calculations based on the Consumer Price Index measure of inflation. ↑ $20 million in 1966 equates to $154,441,026 in 2019, according to calculations based on the Consumer Price Index measure of inflation. ↑ "Definition of Disney, Walt in English". Oxford Dictionaries. Oxford University Press. Archived from the original on April 25, 2016. Retrieved April 12, 2016. 1 2 3 4 Crowther, Bosley (April 27, 2015). "Walt Disney". Encyclopædia Britannica. Archived from the original on April 25, 2016. Retrieved April 12, 2016. 1 2 3 4 "About Walt Disney". D23. The Walt Disney Company. Archived from the original on April 25, 2016. Retrieved April 13, 2016. 1 2 Thomas 1994, pp. 57–58. ↑ Withrow 2009, p. 48. ↑ Gabler 2006, p. 56. ↑ Finch 1999, p. 14. ↑ Barrier 2007, p. 60. ↑ Gabler 2006, pp. 60–61, 64–66. ↑ Finch 1999, p. 15. 1 2 Thomas & Johnston 1995, p. 29. ↑ Barrier 2007, p. 40. ↑ Gabler 2006, p. 78. ↑ Thomas 1994, pp. 73–75. 1 2 Gabler 2006, p. 544. 1 2 Barrier 2007, pp. 102, 131. 1 2 "Alice Hits the Skids". The Walt Disney Family Museum. Archived from the original on July 14, 2014. Retrieved April 14, 2016. 1 2 Soteriou, Helen (December 3, 2012). 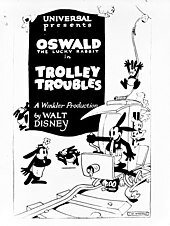 "Could Oswald the Lucky Rabbit have been bigger than Mickey?". BBC. Archived from the original on April 25, 2016. Retrieved April 14, 2016. 1 2 Thomas 1994, p. 88. ↑ Thomas & Johnston 1995, p. 39. 1 2 3 4 5 6 7 8 9 10 11 12 Langer 2000. 1 2 "Regulated Rodent". Time. February 16, 1931. p. 21. 1 2 Gabler 2006, p. 178. ↑ Thomas & Johnston 1995, p. 90. 1 2 Gabler 2006, p. 270. 1 2 3 4 Federal Reserve Bank of Minneapolis Community Development Project. "Consumer Price Index (estimate) 1800–". Federal Reserve Bank of Minneapolis. Retrieved January 2, 2019. 1 2 "The 11th Academy Awards 1939". Academy of Motion Picture Arts and Sciences. Archived from the original on May 7, 2016. Retrieved April 16, 2016. ↑ "The Golden Age of Animation". The Walt Disney Family Museum. Archived from the original on April 14, 2009. Retrieved April 16, 2016. ↑ Krasniewicz 2010, p. 87. ↑ Finch 1999, p. 76. ↑ Gabler 2006, pp. 394–95. ↑ Gabler 2006, pp. 384–85. ↑ Finch 1999, p. 77. ↑ Gabler 2006, p. 399. ↑ "The Disney Brothers Face a Fiscal Crisis". The Walt Disney Family Museum. Archived from the original on June 2, 2014. Retrieved April 16, 2016. ↑ Thomas 1994, pp. 186–87. ↑ Gabler 2006, pp. 445–46. ↑ Thomas 1994, p. 227. ↑ Gabler 2006, p. 452. ↑ Watts 2013, p. 240. ↑ "Testimony of Walter E. Disney before HUAC". CNN. Archived from the original on May 14, 2008. Retrieved May 21, 2008. ↑ Gabler 2006, p. 370. ↑ Broggie 2006, pp. 7, 109. ↑ Barrier 2007, p. 219. ↑ Barrier 2007, p. 220. ↑ Canemaker 2001, p. 110. ↑ "Dreaming of Disneyland". The Walt Disney Family Museum. Archived from the original on May 18, 2006. Retrieved September 6, 2013. 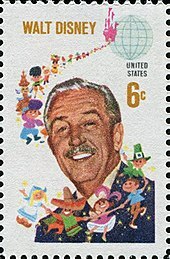 ↑ Walt Disney: The Man Behind the Myth (Television production). The Walt Disney Family Foundation. January 17, 2015. Event occurs at 1:10:00–1:13:00. ↑ Barrier 2007, pp. 233–34. ↑ "The Beginning of WED". The Walt Disney Family Museum. Archived from the original on October 2, 2015. Retrieved April 18, 2016. ↑ Mumford, David; Gordon, Bruce. "The Genesis of Disneyland". The Walt Disney Family Museum. Archived from the original on October 28, 2008. Retrieved April 18, 2016. ↑ Finch 1999, p. 139. ↑ Barrier 2007, p. 246. ↑ Gabler 2006, pp. 524, 530–32. ↑ Eliot 1995, pp. 225–26. ↑ Gabler 2006, p. 498. ↑ Gabler 2006, p. 537. ↑ Gabler 2006, pp. 508–09. 1 2 Gabler 2006, p. 511. ↑ "A Wonderful World: Growing Impact of Disney Art". Newsweek. April 18, 1955. p. 62. ↑ Gabler 2006, pp. 520–21. ↑ Barrier 2007, p. 245. ↑ Gabler 2006, p. 514. ↑ Thomas 1994, p. 257. ↑ Hollis & Ehrbar 2006, pp. 5–12, 20. ↑ Gabler 2006, p. 566. ↑ "The 29th Academy Awards 1957". Academy of Motion Picture Arts and Sciences. Archived from the original on May 7, 2016. Retrieved April 18, 2016. ↑ Finch 1999, pp. 82–85. ↑ Finch 1999, p. 130. ↑ Singh, Anita (April 10, 2012). "Story of how Mary Poppins author regretted selling rights to Disney to be turned into film". The Daily Telegraph. Archived from the original on April 25, 2016. Retrieved April 18, 2016. ↑ Thomas 1994, p. 298. ↑ Barrier 2007, p. 293. ↑ Carnaham, Alyssa (June 26, 2012). "Look Closer: 1964 New York World's Fair". The Walt Disney Family Museum. Archived from the original on May 3, 2016. Retrieved May 3, 2016. ↑ Gabler 2006, pp. 621–23. ↑ Meyers, Charlie (September 1988). "Ski Life". Ski. p. 26. ↑ Gabler 2006, p. 631. ↑ Gabler 2006, pp. 606–08. ↑ Beard 1982, p. 11. ↑ Thomas 1994, p. 307. ↑ Gabler 2006, pp. 626–31. ↑ Mosley 1990, p. 298. ↑ Eliot 1995, p. 268. ↑ Poyser, John (July 15, 2009). "Estate-planning lessons from the Magic Kingdom". Winnipeg Free Press. p. B5. 1 2 Gabler 2006, pp. 629–30. ↑ Dobson 2009, p. 220. ↑ Puig, Claudia (March 26, 2010). "'Waking Sleeping Beauty' documentary takes animated look at Disney renaissance". USA Today. Archived from the original on April 25, 2016. Retrieved April 20, 2016. ↑ "History of The Walt Disney Studios" (PDF). The Walt Disney Company. Archived from the original (PDF) on May 7, 2016. Retrieved May 7, 2016. ↑ Patches, Matt (May 20, 2015). "Inside Walt Disney's Ambitious, Failed Plan to Build the City of Tomorrow". Esquire. Archived from the original on April 25, 2016. Retrieved April 20, 2016. ↑ "Walt Disney World Resort: World History". Targeted News Service. March 18, 2009. ↑ Thomas 1994, pp. 357–58. ↑ "News Update: EPCOT". AT&T Archives. Archived from the original on April 25, 2016. Retrieved April 20, 2016. ↑ "About Us". The Walt Disney Family Museum. Archived from the original on March 30, 2014. Retrieved June 27, 2014. ↑ Rothstein, Edward (September 30, 2009). "Exploring the Man Behind the Animation". The New York Times. Archived from the original on April 25, 2016. Retrieved April 25, 2016. ↑ Dostis, Melanie (October 1, 2015). "13 things to know about the Disney parks on 44th anniversary of Walt Disney World". New York Daily News. Archived from the original on May 21, 2016. Retrieved May 21, 2016. ↑ Pierce 1987, p. 100. ↑ Scott, Tony (October 20, 1995). "Review: 'Cbs Sunday Movie a Dream Is a Wish Your Heart Makes: The Annette Funicello Story'". Variety. Archived from the original on April 25, 2016. Retrieved April 21, 2016. ↑ Gettell, Oliver (December 18, 2013). "'Saving Mr. Banks' director: 'Such an advantage' shooting in L.A." Los Angeles Times. Archived from the original on December 19, 2013. Retrieved June 27, 2014. ↑ Gritten, David (May 17, 2013). "Walt Disney: hero or villain?". The Daily Telegraph. Archived from the original on April 25, 2016. Retrieved April 25, 2016. ↑ "Nominee Facts – Most Nominations and Awards" (PDF). Academy of Motion Picture Arts and Sciences. Archived from the original (PDF) on April 25, 2016. Retrieved April 26, 2013. ↑ "Winners & Nominees: Walt Disney". Hollywood Foreign Press Association. Archived from the original on April 25, 2016. Retrieved April 21, 2016. ↑ "Awards & Nominations: Walt Disney". Academy of Television Arts & Sciences. Archived from the original on April 25, 2016. Retrieved April 21, 2016. ↑ "Complete National Film Registry Listing". Library of Congress. Archived from the original on April 25, 2016. Retrieved April 21, 2016. ↑ "AFI's 100 Greatest American Movies of All Time". American Film Institute. Archived from the original on May 13, 2016. Retrieved May 13, 2016. ↑ "Walt Disney". Hollywood Walk of Fame. Archived from the original on April 25, 2016. Retrieved June 27, 2014. ↑ "Mickey Mouse". Hollywood Walk of Fame. Archived from the original on May 3, 2016. Retrieved May 3, 2016. ↑ "Hall of Fame Honorees: Complete List". Academy of Television Arts & Sciences. Archived from the original on April 25, 2016. Retrieved June 27, 2014. ↑ "John Muir Inducted in California Hall of Fame". The John Muir Exhibit. Archived from the original on April 25, 2016. Retrieved June 26, 2014. ↑ "Disney to be first honoree on O.C. Walk of Stars". Orange County Register. November 8, 2006. Archived from the original on April 25, 2016. Retrieved June 26, 2014. ↑ "Untitled". The Manchester Guardian. December 20, 1935. p. 10. ↑ "Walt Disney Honored". San Mateo Times. San Mateo, CA. February 5, 1952. p. 9. 1 2 "Walt Disney". The California Museum. Archived from the original on April 25, 2016. Retrieved April 20, 2016. ↑ Aarons, Lerby F. (September 15, 1964). "Arts, Science, Public Affairs Elite Honored With Freedom Medals". The Washington Post. p. 1. ↑ Marth, Mike (April 4, 1969). "Walt Disney Honored With Congressional Gold Medal". The Van Nuys News. p. 27. ↑ "Disney Receives Audubon Medal". The Blade. Toledo, OH. November 16, 1955. Archived from the original on December 30, 2016. Retrieved April 25, 2016. ↑ Schmadel 2003, p. 342. ↑ The Two Sides of Walt Disney (Television trailer). PBS. September 10, 2015. Event occurs at 0:08–0:13. Archived from the original on April 25, 2016. Retrieved April 20, 2016. ↑ Gabler 2006, p. 204. ↑ Schickel 1986, p. 341. 1 2 Gabler 2006, p. 205. ↑ The Two Sides of Walt Disney (Television trailer). PBS. September 10, 2015. Event occurs at 0:14–0:25. Archived from the original on April 25, 2016. Retrieved April 20, 2016. ↑ Norman 2013, p. 64. ↑ Krasniewicz 2010, p. 77. 1 2 Watts 1995, p. 84. ↑ "American Experience: Walt Disney". PBS. Archived from the original on April 25, 2016. Retrieved April 22, 2016. 1 2 Gabler 2006, p. x. ↑ Lejeune, C. A. (February 27, 1938). "Films of the Week: Magic for the Millions". The Observer. p. 12. ↑ Allen, Robin (August 25, 1990). "The Real Fantasia at Length, at Last". The Times. p. 16. ↑ Lejeune, C. A. (July 29, 1951). "Alice in Disneyland". The Observer. p. 6. ↑ "Disney's Peter Pan". The Times. April 15, 1953. p. 9. ↑ Dargis, Manohla (September 21, 2011). "And Now a Word From the Director". The New York Times. Archived from the original on April 25, 2016. Retrieved September 26, 2011. ↑ Gabler 2006, p. 448. 1 2 Gabler 2006, pp. 448, 457. 1 2 Gabler 2006, p. 456. 1 2 "Creative Explosion: Walt's Political Outlook". The Walt Disney Family Museum. p. 16. Archived from the original on June 7, 2008. Retrieved June 27, 2014. 1 2 Gabler 2006, p. 455. ↑ "Walt Disney: More Than 'Toons, Theme Parks". CBS News. November 1, 2006. Archived from the original on April 25, 2016. Retrieved April 20, 2016. ↑ Gabler 2006, p. 611. 1 2 3 Gabler 2006, p. 433. ↑ Cohen 2004, p. 60. 1 2 Gabler 2006, pp. 438–39. ↑ Korkis 2012, p. xi. ↑ Watts 1995, p. 107. ↑ Telotte 2008, p. 19. ↑ Tomlinson 2001, p. 41. ↑ Tomlinson 2001, p. 44. ↑ Izard, Ralph S. (July 1967). "Walt Disney: Master of Laughter and Learning". Peabody Journal of Education. 45 (1): 36–41. JSTOR 1491447. ↑ "Obituary: Mr Walt Disney". The Times. December 16, 1966. p. 14. ↑ Cooke, Alistair (December 16, 1966). "Death of Walt Disney—folk-hero". The Manchester Guardian. p. 1.